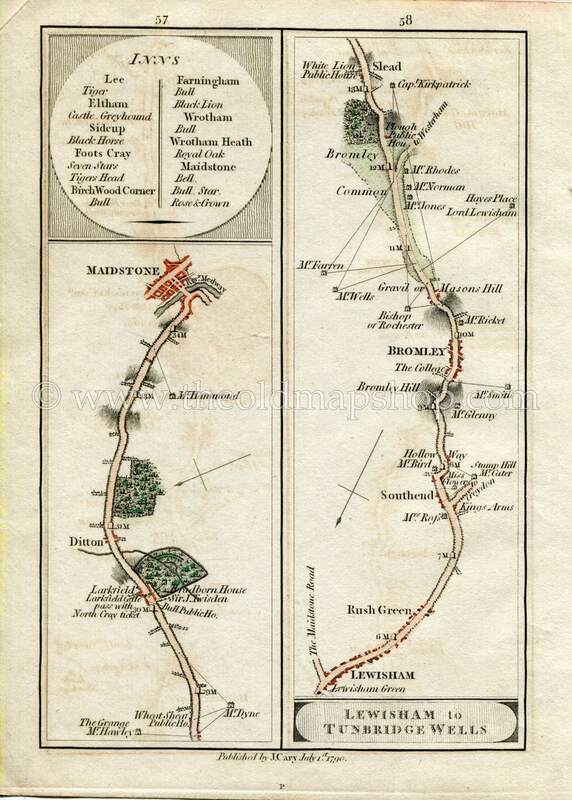 1790 John Cary Antique Road Map showing, Ditton, Maidstone, Lewisham, Southend, Bromley, Bromley Common, London - From ''Cary's Survey of the High Roads from London'' First published in 1790. This map being from that first edition and actually printed in 1790. The reverse side of the page is blank. The size is approx. Page 8.3 x 6 inches. Map is hand coloured. Colour is faded so I would say it is original and was coloured when published. Condition: This map came from a damaged copy of John Cary's book. Most of the maps I will be listing are in good condition for their age. I have shown large size scans of the maps so that the condition can be seen.....Please study the scanned image for all details. Happy to combine shipping for just the one cost if more than one map is purchased. The last 2 image's show a scan of the title page and an information page. These are for provenance only and not included for sale in this listing.